'Ringing' Phones Do Not Mean Malaysian Passengers Are OK : The Two-Way Some friends and family of the 239 people who have been missing since Saturday have called their loved ones' cellphones and heard rings. Sadly, that doesn't mean the phones and their owners are safe. 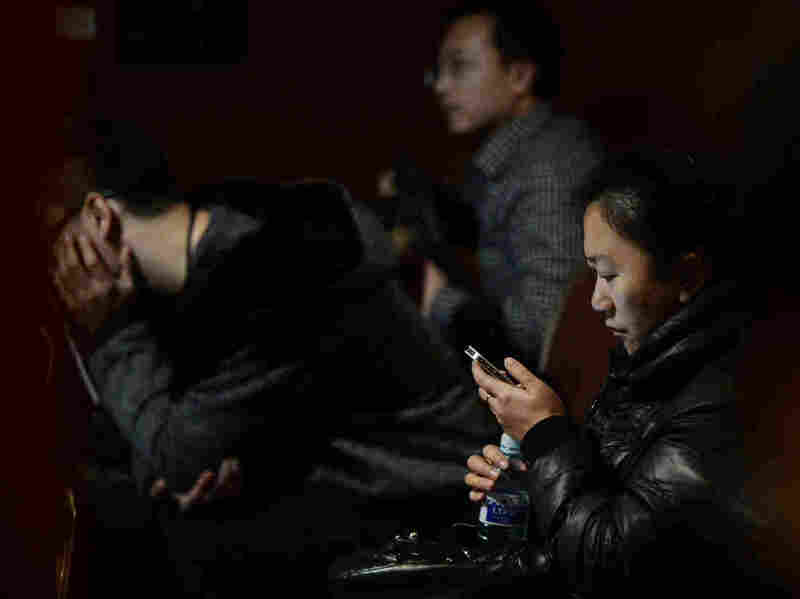 In Beijing, anxious relatives continue to wait for word about the fate of Malaysia Airlines Flight 370. The Beijing-bound jet disappeared on Saturday. Some family members and friends of the 239 people who haven't been heard from since Malaysia Airlines Flight 370 disappeared Saturday say they've been calling their loved ones' cellphones and hearing rings — though no one picked up the calls. Could those rings be a sign, they wonder, that the phones are still working — which in turn could mean that the people they belong to are safe? Sadly, the rings are not evidence that the worst hasn't happened. This happens to him quite frequently, Kagan told us. "My wife will call me and say she heard it ring two or three times. But I picked it up on the first ring [that he heard]." She was hearing the "rings" that the cellphone carrier sent while it was searching for his phone. How long it takes to either find the other phone or determine that it can't be reached depends on many factors. They include whether the person making the call is trying to reach someone whose phone is part of a different network and whether the person being called is in a different country. Such variables can add to the time it takes to either complete the call or disconnect. -- The call might be dropped. -- The call might go to the person's voicemail. -- The call might go to a recorded message saying it couldn't be completed. "There's not a standard way" that such uncompleted calls are handled, Kagan said. Flight 370 was on its way from Kuala Lumpur, Malaysia, to Beijing when it disappeared. The airline says 154 of those on board were from mainland China or Taiwan. "According to Chinese media," the Mirror writes, "19 [Chinese] families have signed a joint statement confirming they made calls which connected to the missing passengers but without an answer." Kagan says he understands why grieving families might get some comfort from or be confused by the "rings" they've heard. But he wishes their expectations weren't apparently raised needlessly. "I hate that they have hope" because of this bit of technology, he said.